The Impossible Burger is made with ingredients including wheat, potatoes and coconut oil. The company, Impossible Foods, wants to bring fake meat to the masses. Its signature product, the Impossible Burger, is made with ingredients including wheat, potatoes and coconut oil. Founded in 2011, the startup now supplies meatless products to more than 1,500 restaurants in the United States. And last month, it expanded into Hong Kong, its first overseas market. The company is the brainchild of Dr. Pat Brown, a biochemist who in 2009 began an ambitious quest to create a plant-based product that people would prefer instead of meat. "For me, the primary motivation was the huge environmental impact [of meat-eating]," he said. "We want to save this wonderful planet for future generations, and it really is at critical risk due to -- believe it or not -- our use of animal and food production technologies." Brown, who's a vegan, previously worked as a professor at Stanford Medical School's Department of Biochemistry. After years of experiments, he says he successfully invented a plant-based "meat" in 2011 -- and Impossible Foods was born. According to Brown, a key part of his recipe is a molecule called "heme" that helps give food a meaty flavor. It's found in meat, but Brown has patented a plant-based version. 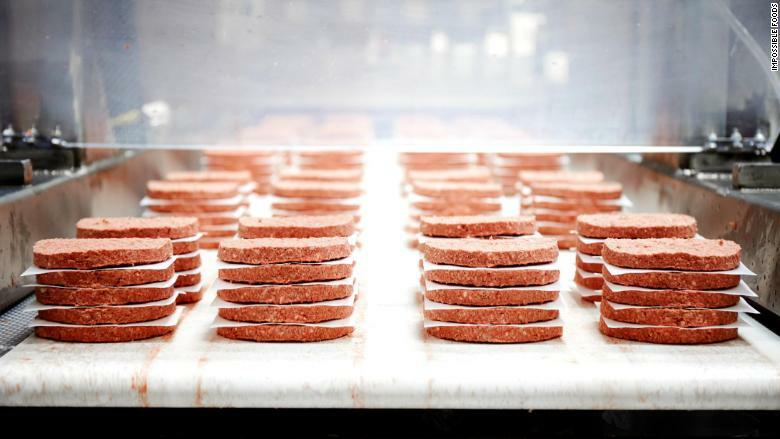 The company says the Impossible Burger's greenhouse gas emissions are about 87% lower than those from regular ground beef burgers from cows. Impossible Foods opened its first large-scale production facility in Oakland, California, last year. Brown's project has gained heavyweight backing. 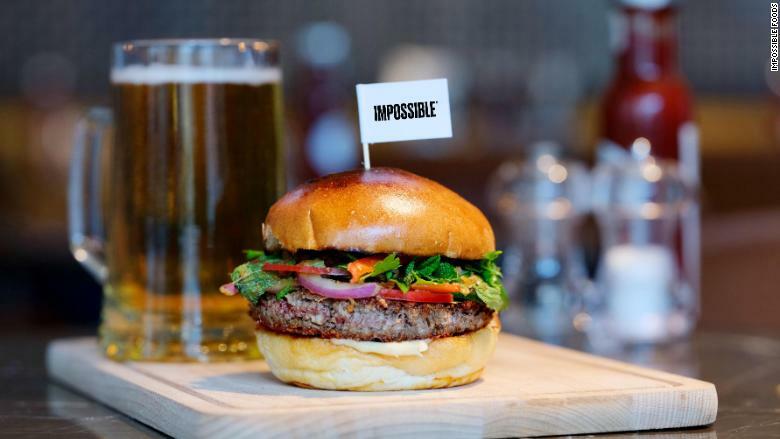 To date, Impossible Foods has raised more than $400 million in funding from investors including Google Ventures and Bill Gates. But the startup is yet to win over the US Food and Drug Administration, which has expressed concern that the company's version of heme hasn't previously been consumed by humans. Brown said the company has voluntarily submitted safety data to the FDA and is "very confident that they're going to find it persuasive." "We don't have to get FDA approval, but we knew that was going to be something a lot of consumers would care about," he said. Brown's long-term goal is extremely ambitious: he says he wants meat substitutes to "completely replace animals as a food production technology by 2035." But analysts aren't predicting a sea change in consumer behavior anytime soon. The global market for meat substitutes is forecast to grow steadily -- but not spectacularly -- from an estimated $4.6 billion this year to $6.4 billion by 2023, according to research firm MarketsandMarkets. Other companies are seeking to lure consumers away from meat. Beyond Meat, which is also backed by Gates, produces plant-based meat alternatives made of pea protein. In Asia, the founder of a vegetarian grocery store chain in Hong Kong is hoping to crack the Chinese market with "omnipork," a pork alternative made from soy, pea, mushroom and rice proteins. Brown says he's not asking people to "sacrifice foods they love." "The only way we win is by making foods that consumers prefer and choose over the food that we get from animals," he said. "That's really the only thing that ultimately matters for our success."